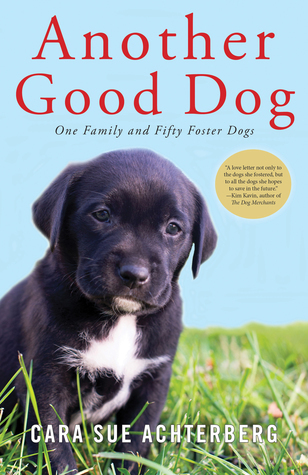 From Goodreads ~ When Cara felt her teenaged children slipping away and saw an empty nest on the horizon, she decided the best way to fill that void was with dogs - lots of them - and so her foster journey began. In 2015, her Pennsylvania farm became a haven for Operation Paws for Homes. There were the nine puppies at once, which arrived with less than a day’s notice; a heartworm positive dog; a deeply traumatized stray pup from Iraq; and countless others who just needed a gentle touch and a warm place to sleep. Operation Paws for Homes rescues dogs from high-kill shelters in the rural south and shuttles them north to foster homes like Cara’s on the way to their forever homes. What started as a search for a good dog, led to an epiphany that there wasn’t just one that could fill the hole left in her heart from her children gaining independence - she could save dozens along the way. The stories of these remarkable dogs - including an eighty-pound bloodhound who sang arias for the neighbors - and the joy they bring to Cara and her family (along with a few chewed sofa cushions) fill the pages of this touching and inspiring new book that reveals the wonderful rewards of fostering. When asked how she can possibly say goodbye to that many loveable pups, Cara says, “If I don’t give this one away, I can’t possibly save another.” Filled with humanity and hope, "Another Good Dog" will take the reader on a journey of smiles, laughs, and tears - and lead us to wonder how many other good dogs are out there and what we can do to help. I love reading books about animals ... and how could I resist the picture of the dog on the cover! This is story of Cara ... a married mom of three children, who is an author (I read and enjoyed her first book, I'm Not Her). In 2015, her dog, Lucy, had passed away and she wanted to get another dog. Rather than adopting another one right away, she decided to foster dogs for Operation Paws for Homes, figuring when the right one came along, she would become a "foster fail" and keep that dog. This is her story of fostering 50 dogs (she has since fostered over 100 dogs) ... the foster times ranged from twenty-four hours to months, puppies (at one point she had 12 new-born puppies and their mother plus other fosters) and older dogs. She keeps a blog of the dogs she fosters. At the end of the book, there are full-colour pictures of the dogs she had fostered (it was great to be able to put a face to a dog as I was reading about). Also there are reasons to foster dogs and reasons why people don't. I enjoyed this book and enjoyed the writing style. The passion for ensuring rescue dogs find homes rather than be euthanized definitely came through. She never hesitated to jump in and do what she could and she had quite the variety of dogs coming into her home. I am a volunteer with a local cat rescue. I would love to foster cats but (1) we have two of our own (our tabico can be a bit bitchy) and (2) I would have a hard time saying good-bye to my fosters (I have friends who were foster fails). So as a social media volunteer, I can use my skills and interests and I'm still helping to find homes for rescue cats and kitties. It was interesting to read how hard it was for Cara and her family to say good-bye to some of the dogs ... some of the dogs they would have loved to have kept but they were happy that they did find their forever homes. She knew that if she kept a dog, she wouldn't be able to save the next one. The author is donating some of the proceeds from this book to Operation Paws for Homes.